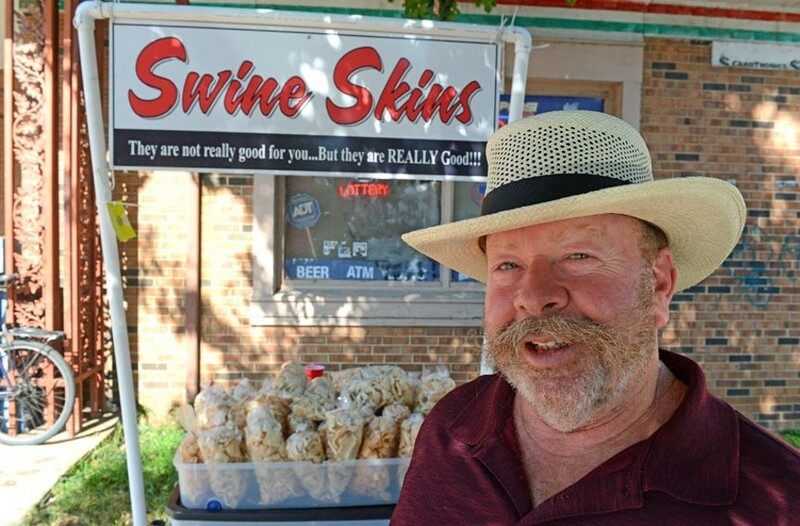 Interview: Marty McCauley, 56, Owner of Swine and Skins | News and Features | Style Weekly - Richmond, VA local news, arts, and events. "I got the idea for this when I was standing around drinking beer and eating not-so-good pork rinds. I decided I could do better than that. When I do my temporary kitchen, it’s known as the Swinery. I do swine tastings. My alter ego: They call me Swino. I make them at farmers markets. I do them at the Great Big Greenhouse on Thursdays from 10 to 2. I have a temporary kitchen set up. I got a 10-by-10 tent and an 85,000 BTU burner. I’ve got a large pot, and I heat up five gallons of peanut oil at once. I throw in a couple of cups of chips. They are rendered pork skins, and they pop up in 60 seconds. I shake toppings on them and people that eat them rave on them. They are the best damn pork rinds. I’ve gotten into extraordinary flavors, I use confectioners’ sugar on ’em, which is funny. People will twist their face: “Sugar on pork rinds?” I say, “Yeah, try these.” I use lemon and pepper, garlic and pepper, sweet, mild and hot barbecue, chipotle and cinnamon, real cheddar cheese, chili and cheese, Old Bay, salt and vinegar and about five more I can’t put on top of my head. I got about 14 to 15 flavors. People come to the Robious and Huguenot market, and some people buy four or five. My biggest single sale was 15 bags — some lady was going to ship them to her friends in Iowa. "The William Byrd Community House — that was my first market. Ana Edwards, who ran the market, said they were trying to promote a healthy food image and that I wasn’t welcome. And I asked, might I give them away? She said yes. I went down the following week, and I gave away 81 bags. She told they were good, and if I got my legal stuff together, she’d have a spot for me. That was in June of 2015. Here we are in October ’17, and it’s going strong. I do the Irish Festival in Church Hill. Had my best sales day ever this past March, I did $1,200 on Saturday and $850 on Sunday. They want 20 percent of your sales as a charitable donation. I like to be above average, I gave them 25 percent. They’re cool. They’re working with God. "I’m semiretired. I’ve been a maintenance and repair man for years. I started a company doing contracting, fixing buildings. Did that for a long time. My wife, Debbie, and I used to go to markets and shows, and we talked about how much fun it would be to do vending. When she got struck with cancer, I stuck with her, even though we hadn’t been together long. I loved her like something I hadn’t seen. I stopped doing what I was doing to take care of her. We got married on our two-year anniversary of being together, so I could take advantage of her benefits. She worked for the state for 35 years as a systems analyst. When Debbie passed, I shifted gears. She’s the reason I’m doing this."